VIDEO: Y'all See These Crazy People Using An Alligator For A Baby Gender Reveal? VIDEO: Y’all See These Crazy People Using An Alligator For A Baby Gender Reveal? Well, you may not be. But maybe they ain’t talkin’ to you. They’re talkin’ to these people – and yeah, they’re wastin’ their time. Hayseeds gonna hayseed. An’ if that involves a live alligator, a watermelon, a syringe and some blue food coloring, then that ain’t gonna bother ’em. Especially since the hayseed in particular here is a dude named Mike Kliebert, also known as “T-Mike The Gator King” – he’s an alligator wrangler and swamp tour guide out of Ponchatoula. So he can run a trout line and all that other stuff a country boy can do to survive. Come explore your guided adventure with a walk through the Swamp People Trail, as you first learn about the production facilities of our 47,000 turtles of all kinds.Continue your adventure as you see over 300 alligators in their natural habitat relaxing, sunbathing, or even nesting. What’s most exciting about Kliebert’s is our 57 year old gators that were hatched in 1957 by Harvey Kliebert. 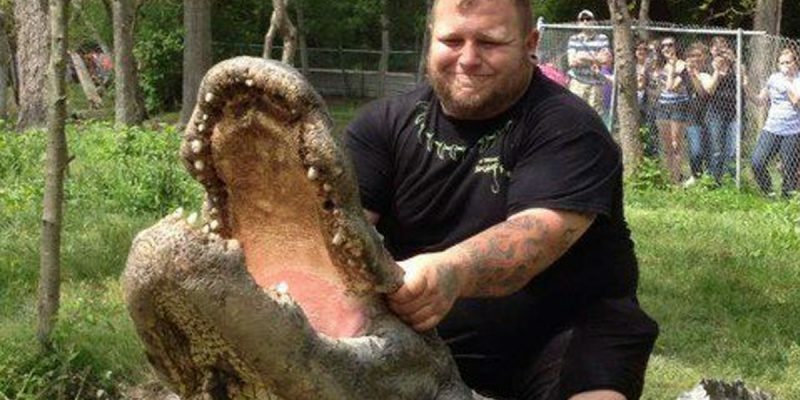 Along this tour you will view our feeding crew as they walk right up to the gators and hand feed these old beasts. Ranging from 9 to 18 feet, you best believe you will have your fill of the swamp! Among many of our other animals, you will be impressed by our Nile Croc (Gumbo), our 15 foot Python (Marie Laveau), and our LEGENDARY CRUSH ( 15 foot, 1200 pound gator). We here at Kliebert’s have nearly nine decades of experience under our belt , so come out and …..GIT YA’ GATOR ON!!! Anyway, that’s one way to do a baby reveal. It ain’t the way most of y’all would do it, which is fine. Like they say on TV, don’t do this at home. Previous Article Alton Sterling Was As High As A Kite The Night He Died. Here’s The Full Toxicology Report.